I love getting in on sneak peeks and being able to share my thoughts with you about upcoming movies! Most recently I was invited to be part of a private on-line screening group of the newest indie film to be making the rounds - Mighty Fine - starring Chazz Palminteri, Andie MacDowell, Jodelle Ferland and Rainey Qualley! The film, based on writer/director Debbie Goodstein's childhood experiences, touches upon the controversial and difficult roles that anger and aggression can play in a family. 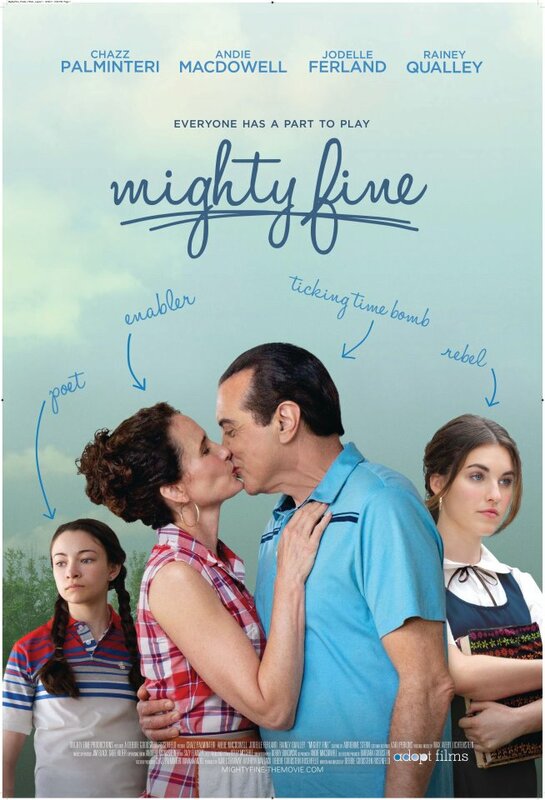 Mighty Fine tells the story of a 1970's family, who move from Brooklyn to New Orleans in search of a better, more prosperous life. The movie paints the picture of Joe Fine's (Chazz Palminteri) love for his wife (Andie MacDowell) and daughters (Jodelle Ferland and Rainey Qualley), juxtaposed against his explosive, rage-filled side, which he often takes out on those closest to him. The emotional abuse leaves Stella, Maddie, and Natalie conflicted between their love for this charismatic, generous man, and their vulnerability in the face of his unpredictable mood swings. Chazz Palminteri gives the performance of a lifetime, that will mesmerize and haunt viewers. I also got to be part of a Q & A with two of the actors and I'd love to share my thoughts on the movie with you. The first thing I noticed is that the film has an innocence to it... I'm sure it's because the story is told through the lens of the writer/director's childhood, so you don't get to see the full picture unfolding the way you might in a story that is written from an adult's point of view... it was kind of like watching a Wonder Year's like version of a movie. In several places I nodded my head, thinking about people who have been in my life who have anger issues and suffer from mental illness... and while you never find out what Joe Fine's diagnosis is, you can infer that he suffers from an imbalance fueled by the era that the movie was set in... the 1970's... where it was still very much a 'mans world' and the world didn't really want to look beyond image. I can't say that I enjoyed the film but I don't think that I was meant to... I think this is an indie film precisely because it's not meant to entertain you but to make you think, react and discuss what you've seen on the screen.